Originally published in 1940. 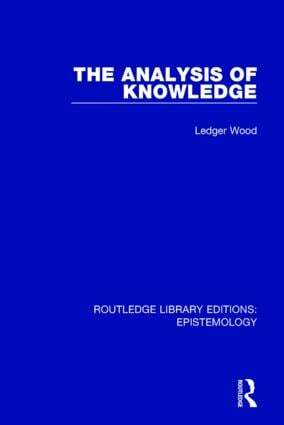 Firstly, this book seeks to combine epistemology and the new developments of the time in psychology. It holds that no epistemology can be sound if it is psychologically defective, nor can a psychological analysis of knowledge be philosophically naïve. Secondly, it attempts to suggest a single structural pattern underlying every type of cognitive situation. Offering a significant reorientation to epistemological thought of its time, this work considers perception, sense and memory and examines the referential theory of knowledge. It is a lucid and precisely organised reading and analysis of knowledge.